Warsaw - Italy has qualified for the 2013 Confederations Cup in Brazil by reaching Sunday's final of the European Championship against Spain. Spain has already qualified for the eight-nation competition as the 2010 World Cup holder. Should the Spanish win on Sunday, their European champion's spot will automatically go to the runner-up. The Confederations Cup is held every four years and is seen as a warm-up event for the World Cup, held the following year. 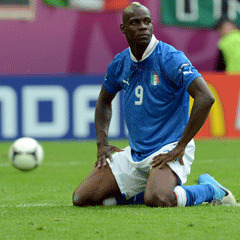 Italy reached the Euro 2012 final in Kiev, Ukraine by beating Germany 2-1 on Thursday in Warsaw. Other teams taking part in the tournament are Brazil, as hosts, Uruguay, Mexico, Japan and Tahiti. The African representative is not yet decided. The tournament kicks off on June 15, 2013 and is played in six Brazilian cities, all of which will also host World Cup matches in 2014. All host cities other than the capital Brasilia, which will host the opening match, will stage three of the 16 games.